Imagine that you’re sitting in a booth of your favorite fast food joint, patiently waiting for a burger that you’ve ordered several minutes prior. You’re working on satisfying a craving that you’ve battled with all day and are dreaming of the steamy, juicy piece of meat that will soon bring you solace. Your order arrives, the smell of the grill dances through the air and you finally immerse your taste buds with the thick, juicy patty that you’ve been waiting for. You eat it quickly before you even realize it’s gone, and you move on. But what if you took a few steps back, slowed down and ask yourself a few questions: Do you know where that cow came from? What about what that cow ate? How about how that particular cow was treated from birth to harvest? The fact of the matter is that most consumers are unable to answer not just one but all of these questions. However, we don’t put the blame entirely on the consumer. After having suffered a great decline in local beef production due to rising costs, Hawaii has become saturated with meat that is imported from the mainland. This is where Kunoa Cattle Company has stepped in, and has high hopes to help regrow the demand for locally sourced meat. 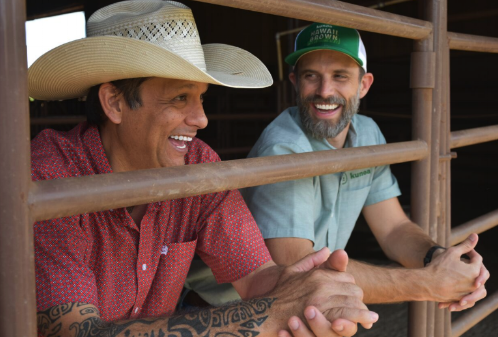 Business partners Bobby Farris, a third-generation rancher and Kauai native, and Jack Beuttell, an impact investment guru, joined forces in 2014 to craft a more sustainable way to keep food here in the Islands. The solution was the merging of a daring vision and the purchase of Oahu’s only US Department of Agriculture-certified slaughterhouse on Oahu. Together, they formed a stand-alone business model that fosters energy independence, improves food resiliency, creates high-quality products and meets the demands of a hungry marketplace. Beuttell shared that approximately 80,000 calves leave Hawaii via plane and boat, pushing Hawaii’s carbon footprint deeper and deeper into the planet. Its Kapolei-based facility – which was once owned by a coalition of local farmers who eventually ran short of funds – was redesigned to closely address that program. This avant-garde processing plant sits on 110 acres of land that boasts energy efficiency and comfortably hosts herds of cattle. The roofs are lined with solar panels, water is recycled, waste is composted, animals graze on lush, open land, and final holding pens are innovatively designed to work with animal instinct before final harvest. In addition to their top-of-the-line slaughterhouse, the team at Kunoa hopes to reduce the size of the exported cattle stream through its buy-sell program. Here’s how it works: they buy the herd from a local rancher, keep select animals based on their quality and frame, and sell the remainder to an interested mainland buyer. In turn, Hawaii-based farmers are able to find profits, more locally raised meat is processed here in the Islands and higher quality meat is more readily available to the everyday eater. Kunoa Cattle Company also hopes to transform the facility into a mixed-use, family-friendly agro-tourism park that further integrates the consumer into the meat industry’s narrative. Their plans focus on fostering an educational environment through interactive tours, rotational grazing demonstrations, an in-house butcher shop and more. “We want to turn this into a complete venue for learning,” Beuttell shared. Today, you can purchase Kunoa Cattle Company’s steaks, ground beef, and other products at more than 30 markets and restaurants on Oahu and Kauai…and the number only continues to grow. For more information on Kunoa Cattle Company, check them out at www.kunoacattle.com.